Truly, I say to you, whatever you bind on earth shall be bound in heaven, and whatever you loose on earth shall be loosed[a] in heaven. Colossians 1:13, 14 “He has delivered us from the domain of darkness and transferred us to the kingdom of His Beloved Son, in whom we have redemption, the forgiveness of sins”. At one time, all of us sinners belonged to the domain of darkness and were ruled by demonic spirits. The cross is the instrument by which God delivered us from the penalty of our sins and from the hand of Satan. Now we are a part of God’s kingdom. Matthew 18:18 “Truly, I say to you, whatever you bind on earth, will be bound in heaven, and whatever you loose on earth, will be loosed in heaven”. To bind means to make secure by tying – like arresting by putting handcuffs. Binding is done by legal authority. We have the legal authority in the name of Jesus to bind the works of darkness and all demonic activity. We, who were once ruled by the kingdom of darkness, now can stop its advancement. That’s real authority! Loose means to untie, release and set free. People need to be loosed from destroying influences. 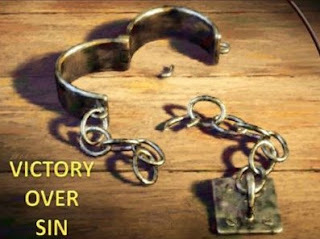 Jesus gave us the legal authority to set people free. In Acts 8, we see Simon, who was a sorcerer in Samaria. He held the people in awe through the power he demonstrated. But when he saw the Holy Spirit power in Peter and John’s life and in their ministry, he was so amazed that he offered to buy this great power. Now, this power is yours through Christ Jesus. Use it over the powers of darkness, and set people free, in the name of Jesus. Dear Lord, we thank You for the victory that You bring to each of us. Help us to share that gift with those around us today. In the Name of Jesus, Amen.